What does the history of the kaiju genre (kaiju translates to “strange beast”), from Godzilla to Attack on Titan, and Pacific Rim, tell us about the deeper implications of Subset Game’s newest title, Into the Breach? Quite a bit actually, but to get there, we’ll need to do some time-travelling. It was the hours before dawn on the first day of March in 1954. A Japanese fishing vessel called the Daigo Fukuryu Maru (“Lucky Dragon 5”) floated 80 miles east of Bikini Atoll in the Marshall Islands. It’d been five weeks since the ship left its home port of Yaizu. The 23-man crew had little to show for their time and efforts. They’d intended to fish the waters of the Midway Sea near Midway Atoll, but decided to change locations after losing the majority of their trawl nets. Before the first hints of sunlight could rise above the eastern horizon, an incredible flash of light lit up the sky from the west—like a second sun. Minutes later, a cacophonous shockwave swept past, followed by what appeared to be snow. The snow, which the crewmen would later call shi no hai (“death ash”), was actually calcified Bikini coral, rich in radioactive fallout. The United States had just carried out its Castle Bravo nuclear test, detonating a thermonuclear bomb—the largest they’d ever detonated, at the time—that yielded over twice as many megatons of TNT as they had anticipated. The Daigo Fukuryu Maru was directly in the path of enormous amounts of unanticipated fallout. The vessel’s crew had no idea about the danger of the ash that fell aboard their ship. They made little effort to clean the deck or protect their meager haul of tuna from the mysterious falling substance. One crew member even licked the ash. Others stored some in small jars, intrigued by the curious novelty of it all. Two weeks later, the Daigo Fukuryu Maru returned to Yaizu. With it, it brought a crew afflicted with acute radiation poisoning and a load of irradiated tuna. Around the time that the Daigo Fukuryu Maru returned to port (and subsequently set off a massive and historically vital series of events that caused panic in Japan and shaped the world’s perception of nuclear testing), a man named Tomoyuki Tanaka was looking for ideas. Tanaka was a movie producer for Toho Studios in Tokyo. He had seen the success of Hollywood films like King Kong, and happened to be looking for a new project. The fate of this infamous tuna trawler inspired the first seeds of modern kaiju. Tanaka would make a monster movie. He would call it Godzilla. The movie released in 1954, receiving tremendous acclaim from critics and movie-goers. Godzilla spawned volumes of sequels, remakes, and knock-offs over the next several decades. It also gave birth to the kaiju genre which now spans across multiple mediums. The story of Godzilla was always simple on the surface: a giant beast was on the prowl after having been awoken by nuclear testing. There appeared to be very little anyone could do to stop it’s destruction. All the military might that could be mustered against such a beast seemed to just not be enough. Beyond that simple premise, though, was something far more significant: Tanaka exposed a deep fear of the modern world. Godzilla was as much a metaphor for nuclear armageddon in the Atomic Age as it was a giant, building smashing prehistoric monster. The consequences of nuclear testing and armament were mysterious, but clearly posed an extraordinarily perilous threat. The creature captured the worries of a generation in the same way that Dracula and Frankenstein had in generations past. Since Tanaka’s Godzilla first hit the big screen, the kaiju genre has seen its ups and downs. The so-called Golden Age of kaiju lasted until the end of the 1960’s. After which time the public, both in Japan and America, began to lose interest. This lasted, despite considerable efforts to revive the genre, until well into the 2000’s. Recently, animes like Attack on Titan and movie series’ like Cloverfield and Pacific Rim have seen ample commercial success. Is the world experiencing a kaiju revival? At this point, you may be wondering what any of this has to do with the tiny tactical trolley dilemma that is Into the Breach. Don’t worry, I’m about to tell you. Credit to @NotDracon on Twitter for this apt depiction. Let’s consider what’s at stake in Subset’s game: you control a squad of time travelling mechs attempting to save the world from an unceasing force of giant, building sized insects called the Vek. This is similar to the science-lite Pacific Rim (time travel notwithstanding), in which Earth’s greatest pilots manned towering mechs to fight equally large beasts that emerged from an inter-dimensional gateway beneath the ocean. Into the Breach, like Pacific Rim (and Godzilla, to a lesser extent), features a world in which preventing the loss of life is simply not reasonable. Where the game differs, however, is in how heavily that compromise is emphasized. The objective is not to save everyone. Rather, it is to save someone, anyone. This shift in attitude is important. In fact it’s so important that it’s a core mechanic of Into the Breach. Player health is not measured in hit points or percentages. Instead, success is measured by the amount of wanton death you’ve allowed the Vek to inflict. The lives of the hapless bystanders of the game’s islands your only meter. Loss of life is acceptable—inevitable even—so long as there is still something left in the end. Perhaps the idea of mechs fighting kaiju, insofar as Into the Breach takes it, speaks to both the acceleration of humanity’s technological advances and the fact that, in the face of a rapidly changing world, we have yet to solve many of the cultural and physical problems these changes have created. Pollution, climate change, and deforestation immediately spring to mind, while more nebulous issues such as the way technology influences our lives and cultures have many concerned. Perhaps even this basic idea resonates with us all. We’ve come to believe that death is unavoidable in the struggle to merge humanity with technology. Even so, the time travel aspect of the game demonstrate the ceaseless efforts of good humans to overcome these challenges. No matter the personal cost. In a little over a century, we’ve gone from horseless carriages and the extinction of the classic cowboy, to robots on Mars, global surveillance, and intercontinental thermonuclear weapons. Yet, the fear of what unknown consequences these advances may yield—fears which led to the creation of the first modern kaiju in 1954—are still pervasive truths around the world. Into the Breach shows us that we haven’t learned much, but as long as someone is around to try, there may still hope. Subset’s Into the Breach is our Cliqist Game of the Month. We have lots to say about the game, including this video review and this awesome look at the history of mechs. 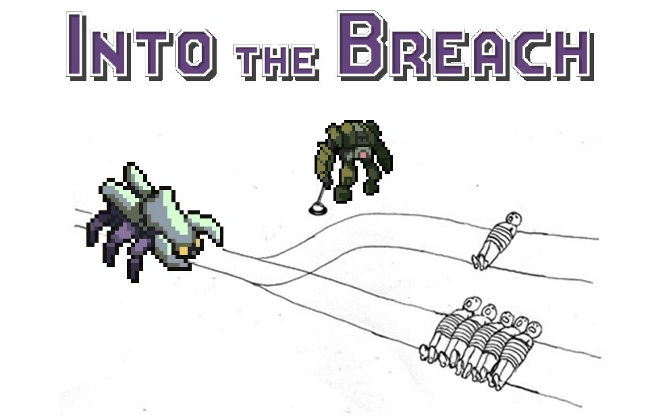 Into the Breach is available on Steam, right now.